Cover graphic of Early January 1972 OB Rag, Vol 2, No 4. In this continuous series about the history of urban planning in Ocean Beach, I’m attempting to outline the historical record so newer generations of OBceans can appreciate how OB came to be what it is today. 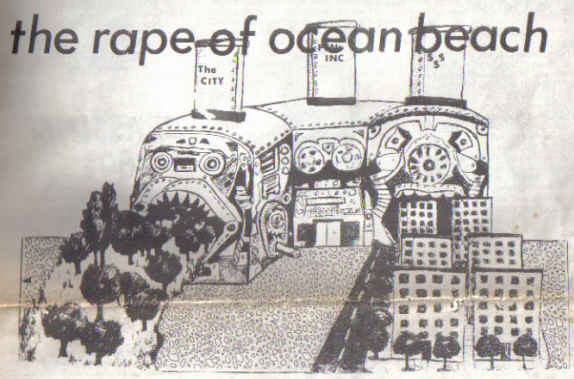 OB is the way it is today due to the trials and tribulations of this Seventies community of activists – who pushed this community out of the way of highrise and a drastic redevelopment of OB’s waterfront and into having a democratically-decided urban plan and design for the community. OB is one of the first communities in the history of San Diego – yea, even the State of California – to have a popularly elected planning committee. The formation and election of the OB Planning Board, its underlining planning document – the OB Precise Plan – are the subjects of this series within my broader story. Much of what I describe I personally witnessed and experienced, as I was deeply involved both in the early development of the Board in the mid-seventies, and then sat on the Board twice – the first time in the early Nineties, and the second time as Chair back in the early days of this decade. 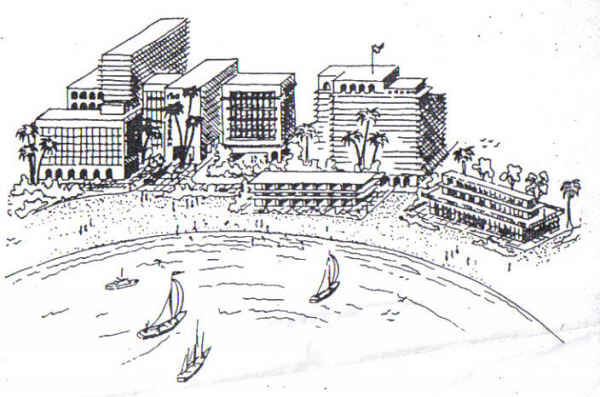 What the original Ocean Beach Precise Plan, circa 1968, envisioned for OB's waterfront. Let the story continue …. Peninsulans, Inc., a non-profit and the elite child of the business-oriented Peninsula Chamber of Commerce, was formed in the mid-Sixties to map out a urban design plan for the Peninsula Proper and its communities – Point Loma, Loma Portal and Ocean Beach. Pen. Inc, was designated by the City to be the “citizen’s committee” that had the authority to sit down and make plans with the City planning department. The Peninsula Community Plan was the product of this wedding. Pen Inc was a non-profit, incorporated in November 1965, “to aid in creating and putting into effect a functional community plan for the Peninsula.” They had breakfast meetings every two weeks at 7:30, and required membership fees to join their elite club of real estate people, developers, insurance agents, lawyers, bank officials, contractors and business owners. It included Tom Fittam, Jr., owner of the Bali Hai restaurant on Shelter Island, who also owned other expensive eateries in town. Gene DeFalco was also in the original Pen Inc, owner of a couple of high-end large markets in Point Loma and Little Italy. Another developer in the group, Tom P Faulconer, reportedly was attempting to purchase land that became Collier Park West, and who owned the two largest apartment buildings near the so-to-become park. Page Cummings was in Pen Inc as the group’s secretary. Cummings was the vocal leader of a militant ‘born again’ Campus Crusade for Christ crusade. She owned income-producing property at the foot of Saratoga. Ross Tharp was also in it. Tharp had been the legal adviser of Pen Inc for years, then was appointed to the Superior Court bench. He presided over at least three trials of people arrested during the Collier Park Riot that occurred in March of 1971. He failed to disclose his connections with the parkland and Pen Inc, meting out what seemed to some observers as harsh penalties. He even later denied a motion from one of the defendants for a new trial based on the judge’s conflict of interest with Pen Inc. It included another developer, Jack Crowningshield, who became infamous as a target for later anti-development protest actions led by the OB Ecology Action Committee due to his penchant for building apartments. Crowningshield, along with his wife, Gloria, owned Peninsula Realty. During the 1970 OB Jetty fight, his office was fire-bombed by sandy rascals. But who has done this planning? An “interested” citizens group has worked with the City Planning Department for 3 years spending huge amounts (close to $50,000 annually) of tax money to devise the Plan. The group is composed o several members of the Board of Directors of Peninsulans, Inc. (who so kindly took care of Collier Park for us), augmented by residents and merchants. The members of the small group conveniently have large land interests in Ocean Beach. At the same time they have drawn up a plan to greatly increase the monetary value of that land. As you can see, there aren’t any mechanics, welders, cooks, telephone operators, workers, artists, sailors, students, ecologists, sociologists on the Precise Planning Board. …and its no accident that there isn’t a true representation of a real cross-section of the OB community. The committee is made up of real estate speculators and greedy business people. There wasn’t any environmental, sociological or true economic impact study conducted by this group, except maybe the economics of profit and how to increase the value of land. The vast majority of the membership of the Precise Planning Committee own property that will become more valuable in the Precise Plan is implemented. These observations may have been true – these folks certainly appear part of the propertied and business elite of the area, but these are certainly serious charges. Just what kind of perceived monster did the Pen Inc create with the OB Precise Plan? 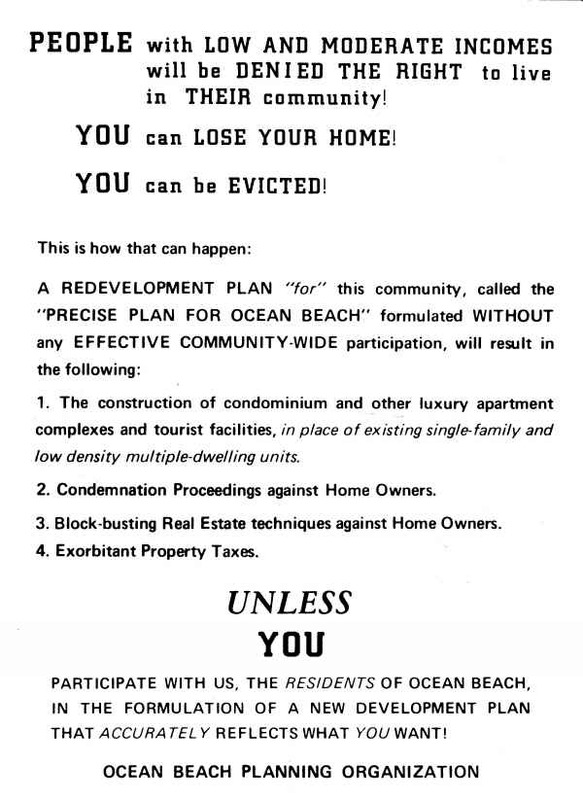 Actually, the OB Precise Plan, at least the first one, was not different than what the Peninsula Community Plan called for in terms of density and types of residential housing permitted for Ocean Beach. Density limits were key. Density limits determined whether the neighborhood was single-family residential homes, apartments, or high rise. Remember- these were the days before the 30 foot height limit. Let’s look at what these definitions allow by viewing graphics right out of the Peninsula Community Plan itself. 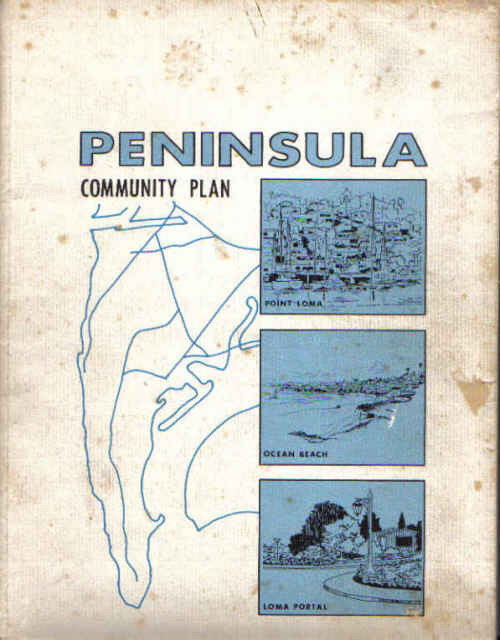 (Peninsula Community Plan, 1968, pg 22). Lower densities were of course proposed for the more scenic sections of the community and the for the hill itself. West Point Loma-Voltaire – Medium high, medium and low medium residential densities are proposed. Medium high density multifamily development is proposed for an area generally bounded by West Point Loma Boulevard, Famosa and Valeta. …. The goal of Pen Inc and their plan was to maintain the quaintness of the single family areas at the expense of high rise and high density in Ocean Beach (and Roseville). Of course, no one – least of all Pen Inc – asked Ocean Beach. Opposition to the Precise Plan: flier of the OB Planning Organization. They weren’t kidding. And they really didn’t know to what extent that “opposition” would mobilize against them. They didn’t know that the opposition would be so strong in Ocean Beach that their entire Precise Plan would be derailed over the next few years, and that the backlash they caused would result in the first democratically elected planning committee in the history of the state. Ah, but that is all for a future segment of the story of urban planning in OB. thanks frank for putting this history up. the minute we stop watching these sorts, they start plotting again…. * I was briefly related to Gene DeFalco by marriage when my uncle Frank Webber married DeFalco’s sister Santina. I was a teenager then and probably was in the same room with him a half dozen times – mainly around Christmas. * I don’t know if the Tom Faulconer mentioned above is related to our city councilmember Kevin Faulconer. I did phone and email Faulconer’s office on this but did not receive any response. * Ned Titlow was listed that’s true. But many of us know him as a kind, gentle sole whose heart is in OB. His daughter Carol knew many of the grassroots activists and was sympathetic to their/our efforts. I remember walking door to door handing out notification fliers to residents to stop “the plan”. It was really something, and even though I was only a youngster, I understood the ramifications of “the plan” and what a nightmare it would be if it went in to effect. This is what I love most about Ocean Beach, with the exception of those Starbucks bastards and the creepy 7-11 on Bacon (excuse me if you enjoy getting a fountain drink there, but I remember when that corner was home to an independent soft serve ice cream joint), we’ve managed to keep it real in O.B. No Winchell’s Doughnuts either, though you know they tried their best to get in. I guess the threat of being bombed scared them away. Thanks Frank for revisiting what many of the newer residents of the community may not be aware of . . . something that we rallied hard against, and in doing so made it possible for everyday people (rather than millionaires) to live in this town. Amber – thanks for sharing your memories – what a treat! It makes that history so much more real for newbies to read what real people did back then. Thanks again. 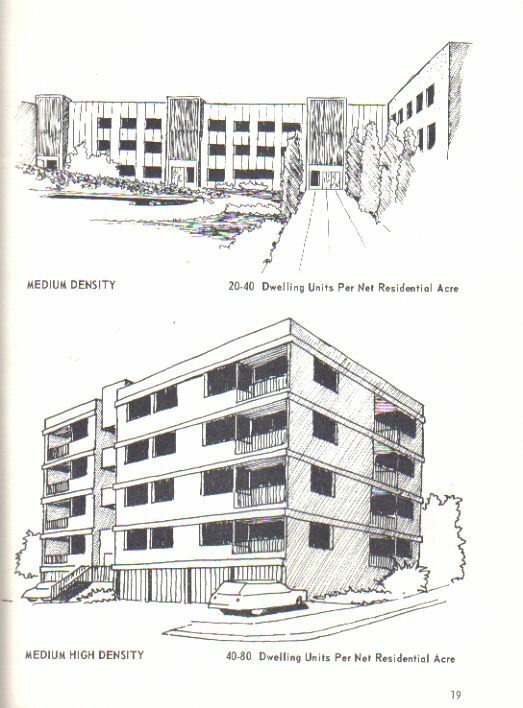 The medium density illustration reminds me of the Federal Building downtown. The medium high density reminds me of the hideous condo complex at the foot of Pescadero Ave. The people of OB should read about this from time to time just as we nationally should read of the Revolution. Now, is our councilman related to “Another developer in the group, Tom P Faulconer”? I rented 5 years from Joe Richardson, a jazz drummer besides being in insurance, and a wonderful guy. I doubt he was of the same ilk as the others.